Shuixian Oolong Tea (Water Fairy) - Tarzan of Wuyi? 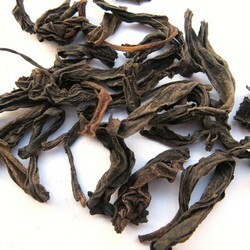 An unforgettable AAA grade Shuixian tea from the Wuyi Mountain. This roasted oolong was harvested from the Big Rock in June 2009. His popularity is remarkable when you consider he has only been cultivated in Wuyi in the last 200 years. Together with Dahongpao and Rougui, he is one of the three most widely cultivated teas in Mountain. The word "Shui Xian" means Water Fairy. A friend of mine likes to say: Rougui is for the fragrance, Shuixian is for the water. On the outside, this AAA grade resembles the Tarzan - stout, muscular and powerful - exactly how a high grade Wuyi variety should look like. Internally he is more feminine The liquor is smooth, rich, full-flavored and mellow. The aroma is an orchird perfume: high, light and lasting.